Here it goes, are you ready? For those of you who are new, I am challenging moms to get real with their children’s prayer lives. My family and I are making a commitment to pray each day, but I also know how life gets the best of us and if it doesn’t happen for three crazy nights in a row–its OKAY! Gratitude–what are they thankful for. Note: For little kids, they can either color a picture or use certain colors like red for being angry, blue because they are thankful for something God did, etc. The entire family uses the same journal. We used this concept when the kids were little, it also allowed me to go back and pray over my husband’s prayers later on. 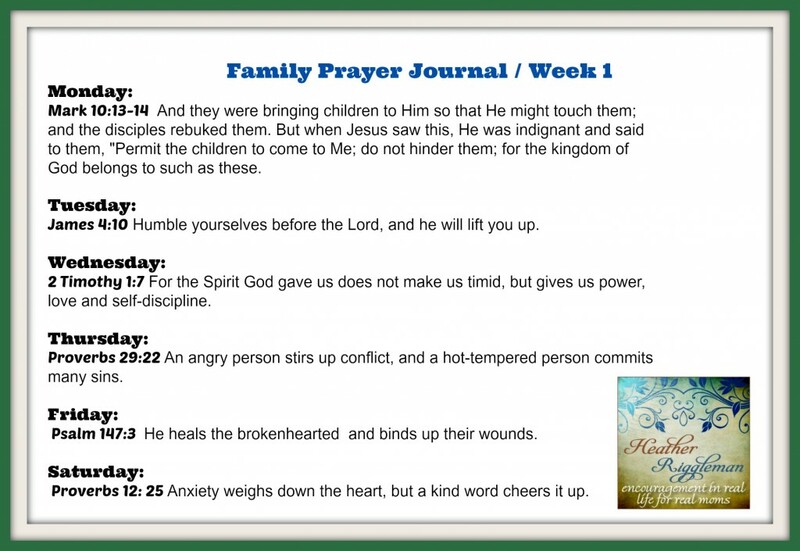 So I’m challenging moms to have their family use individual prayer journals or a community prayer journal to write out their prayers after reading one scripture verse each day. Each week I will post a set of new verses to use. And they were bringing children to Him so that He might touch them; and the disciples rebuked them. But when Jesus saw this, He was indignant and said to them, “Permit the children to come to Me; do not hinder them; for the kingdom of God belongs to such as these. Tuesday: James 4:10 Humble yourselves before the Lord, and he will lift you up. Wednesday: 2 Timothy 1:7 For the Spirit God gave us does not make us timid, but gives us power, love and self-discipline. Thursday: Proverbs 29:22 An angry person stirs up conflict, and a hot-tempered person commits many sins. Friday: Psalm 147:3 He heals the brokenhearted and binds up their wounds. Saturday: Proverbs 12: 25 Anxiety weighs down the heart, but a kind word cheers it up. Click on the picture to for a printable copy!